I had a late start today, and decided to follow my stomach to lunch. 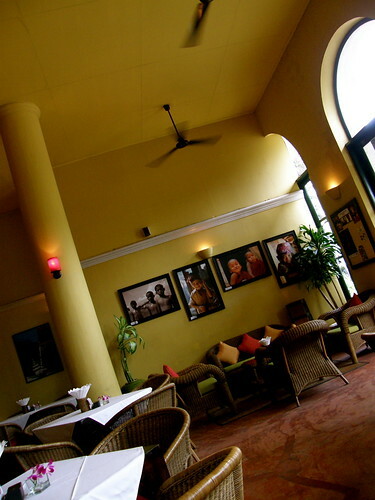 A short walk later, I ended up at this restaurant, Monsoon. It was a pretty fancy place, with fairly fancy prices as well. As In has been going on about the wonders of a tea leave salad (Lephet Thoke), I ended up ordering one, along with a braised eggplant dish (Kayanthee Hnut). The tea leave salad was amazing, and I finished it up. 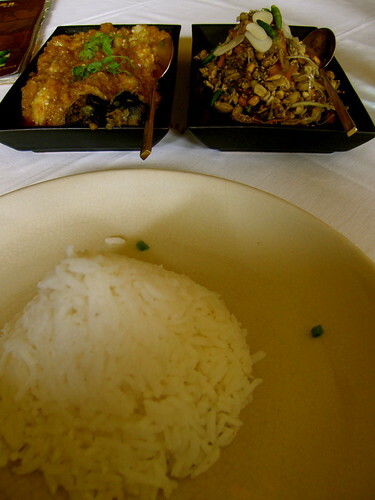 Didn’t really finish the braised eggplant dish, though. They also offer Vietnamese drip coffee. It was pricy, but it was definitely worth it. I decided to try and walk off my lunch. It was pretty cool to take in the street scenes along the way. 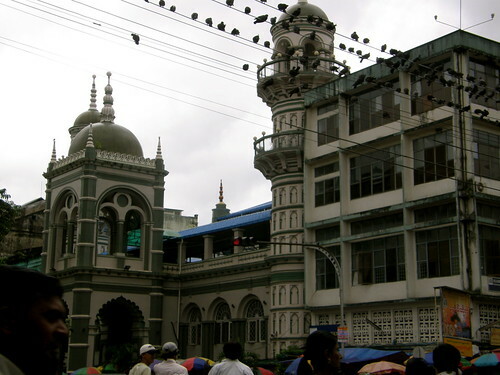 For instance, it appears that the city of Yangon seems to be powered by generators, instead of a national electricity provider. It’s kinda sad that people have to take charge of basic services on their own. It’s also interesting to see how people try to deal with embargoes. 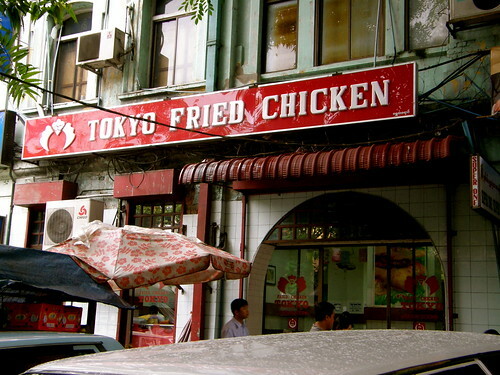 For instance, they have stuff like Tokyo Fried Chicken, and other local-brand donuts, which attempts to feed the need for fast food. 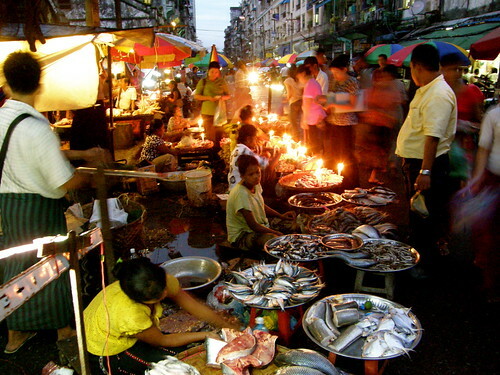 There are, however, also other scenes from the past – for instance, the ubiquitous betel nut seller. 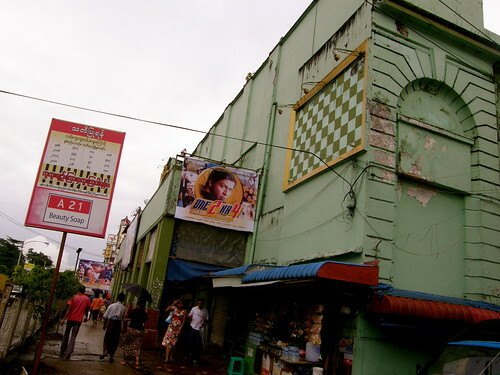 Post-lunch, I surveyed some of the cinemas in Myanmar. It was a pretty interesting experience. While people think the US is the most dominant culture market, with the ability to spread their culture through movies, it was slightly different in Myanmar. The dominant movies watched in Myanmar are from China and India. Red Cliff was showing, and there were also many cinemas at the cinema row, which are showing Bollywood films. In terms of architecture, the interior of some of the cinemas are also quite interesting – they are designed more like opera theaters. Unfortunately for me, the weather was not cooperating that much. It started raining in the mid-afternoon, so I ended up taking a little tea break at a donut shop, and doing some readings. Thankfully, the rain lasted just for an hour or so, so I was able to continue on my little walk. 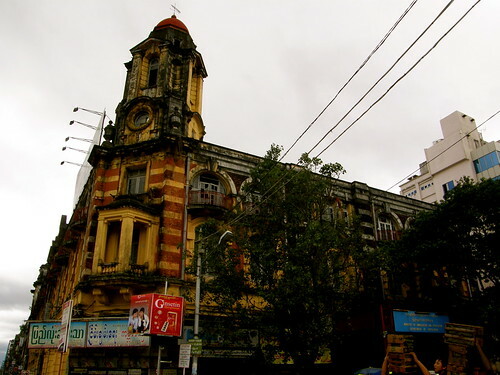 As a former British colonial city, it was an interesting intellectual exercise. It really does not seem that different from Singapore. It appeared to be another cosmopolitan city, albeit stuck in the 1970s or something. It really makes me think of Singapore that I grew up with in the 1980s, with its intricate mosques, grand churches and elaborate temples beside each other. There are also very intricate shopping malls with different colors. I really felt like I traveled back in time. As the sun started to set, the city started to come alive in a different way. People started to bring out their food, and displayed them on the streets. They also brought out those tube lights, to give the city some lights. It was a tricky little walk, as there were many potholes on the ground. 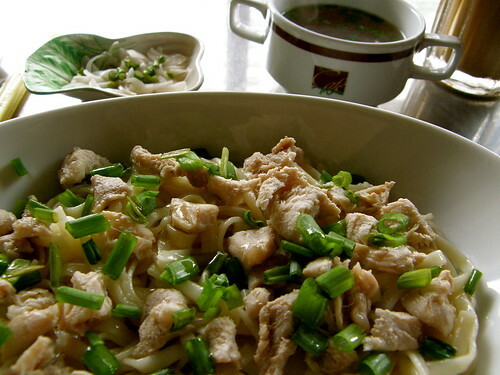 After a dinner of So Thet (noodles with spring onion oil), I decided to retire early, as it was getting way too dark.